We believe good service is all about trust. That’s why we offer a 5-year warranty on our installation services. If anything goes wrong during that time as a result of our work, we’ll be there to fix it right away. Same goes for your Solatube product. If it stops performing as you expect due to defects in workmanship or materials over the 10-year warranty period, Solatube International, Inc. will repair or replace it…guaranteed. 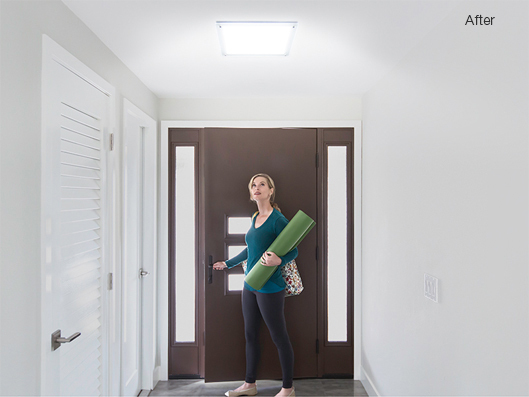 Solatube International, Inc. guarantees that when using the Natural Effect Lens**, the 160 DS and 290 DS Daylighting Systems deliver more Average Daily Light on an Annual Basis (as determined by the methodology set forth below) than other passive tubular daylighting devices having the same “L over D ratio” (as defined below) that are widely commercially available on the market at the time of your purchase. We are totally confident that no other product offers the total annual performance of a Solatube product. We will give you YOUR MONEY BACK (retail purchase price) if you find such a product. Guarantee offer applies only to products purchased for personal use. Offer is only valid for products assembled and installed according to the manufacturer’s specifications. Offer excludes new products manufactured by Solatube International, Inc. The guarantee excludes all other products, except Solatube 160 DS and 290 DS products, manufactured by Solatube International, Inc. Offer expires one year from the product purchase date. The ADLAB is determined by measuring the light output of a system at each hour during daylight hours on the 21st day of March, June, September, and December. To determine the ADLAB, these measurements are then added together and divided by the total number of measurements taken. To compare ADLABs, the systems compared must have the same ratio of Length of the daylighting tube divided by the Diameter of the tube opening. This is called the “L over D ratio.” Testing must be completed by a certified testing agency.